Screenshot/YouTube‘Mannequin Skywalker’ in space strapped into Blu Origin’s New Shepard rocket. On Tuesday, Jeff Bezos’ Blue Origin spaceflight company successfully launched a dummy named Mannequin Skywalker into space and safely returned it to Earth. It was one short flight for a dummy, but could portend a big leap for humankind. Mannequin Skywalker rode aboard New Shepard, a prototype rocket being developed by Blue Origin. This was the seventh safe trip of the rocket. Blue Origin hopes it will one day take human crews into orbit, giving passengers a few minutes of zero-gravity flight and views of the Earth. On Thursday afternoon, Bezos took to Twitter to share the full, eleven-minute video of Mannequin Skywalker’s flight. 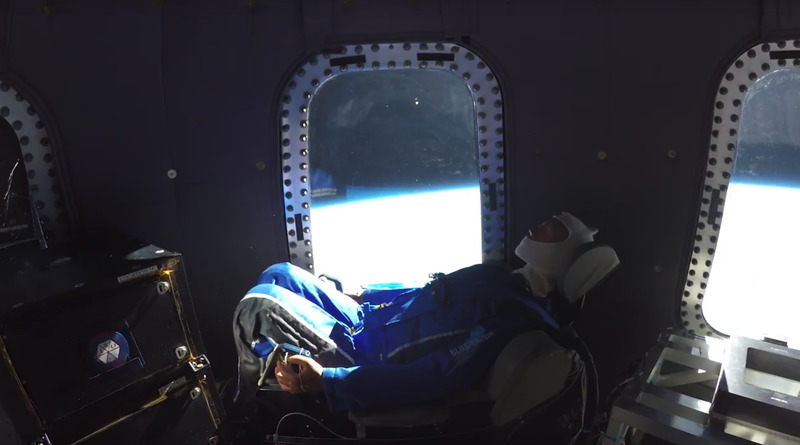 The video lets you see out the window as the dummy takes off, zooms into space, and then safely returns planetside. Bezos promises future customers will have a better experience than the dummy’s. “Unlike him, you’ll be able to get out of your seat during the zero gee part of the flight,” Bezos wrote on Twitter. “And ignore the pinging sound – it’s just from one of the experiments on this flight.